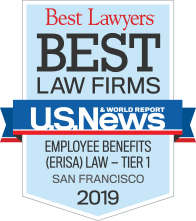 Clarissa advocates zealously and effectively for employee benefit plans, plan administrators, plan sponsors, and other fiduciaries before federal and state courts and government regulatory agencies. 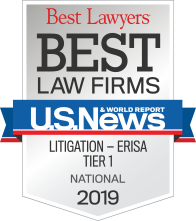 As a director in our nationally recognized ERISA litigation group (First Tier Nationally in US News and World Reports Best Lawyers), she has handled a broad spectrum of litigation, including cases involving benefit claims, fiduciary issues, plan administration, multiemployer plans, withdrawal liability, delinquent contributions, plan reimbursement and subrogation, non-ERISA benefit plans (such as governmental plans and church plans), and class actions. In addition to serving as an advocate in active litigation, Clarissa advises and represents retirement plans, health and welfare plans, and plan fiduciaries in investigations and agency actions commenced by the U.S. Department of Labor, the Internal Revenue Service, and U.S. Department of Health & Human Services. Taking a practical and thoughtful approach, Clarissa provides advice and support to plan fiduciaries in their determination of benefit claims and appeals. With an eye for detail, she negotiates investment management and service provider agreements on behalf of plans and their fiduciaries. Clarissa is a frequent presenter on ERISA litigation, plan administration, benefit claims administration, and fiduciary responsibility, including recent presentations on “Writing ERISA Out of the Plan: Litigation Avoidance Tactics,” in February 2017 at the ABA Labor and Employment Law Section Employee Benefits Committee 2017 Midwinter Meeting and “The Evolving State of New Remedies & Equitable Relief under ERISA Section 502(a)(3)” in February 2018 at the ACI 20th National Forum on Litigating Disability Insurance Claims. For several years, she has been an instructor at the annual American Bar Association Joint Committee on Employee Benefits ERISA Basics National Institute, speaking on spousal rights in the wake of U.S. v. Windsor, benefit claims administrative procedures, and ERISA ethical issues. Clarissa has also spoken on benefit claims administration under the Affordable Care Act and has authored several articles, including articles on judicial review of benefit claims, remedies after CIGNA Corp. v. Amara, the reasonableness of service provider arrangements, and qualified default investment alternatives. Clarissa is admitted to practice before the state and federal district courts of California (Northern, Central, Eastern, Southern), the Ninth Circuit Court of Appeals, the U.S. Supreme Court, and the state and federal district courts of Hawaii. She has been listed as a Northern California “Super Lawyer” in the area of employee benefits law since 2014 and received the Minority Bar Coalition 2015 Unity Award for promoting diversity and inclusion in the legal profession. Must Benefit Denial Letters Inform Claimants of a Plan’s Time Limit for Bringing a Lawsuit?